So for the final installment of these spring trends is, last but not least, makeup trends! Matte skin is out! Dewy foundation that gives you a fresh looking and youthful face is all the rage for spring and summer 2013. Since your foundation is one of the main focuses of a full-­‐face regimen, you want to have it as flawless as possible. At the end of the day you want your skin to still look like skin, right? So this season try out a dewy foundation if you haven’t already and give your face that extra radiance it deserves. What is spring without color? Along with dewy skin, bright pops of color are appearing everywhere. A very neutral eye with a pop of color in the inner corner or on the lower lash line is very popular and an easy way to stray away from that usual smoky eye. Bright colored eyeliners are also becoming very popular. Blue and green hues of eyeliner help put an effortless bit of intrigue to a simple eye look. 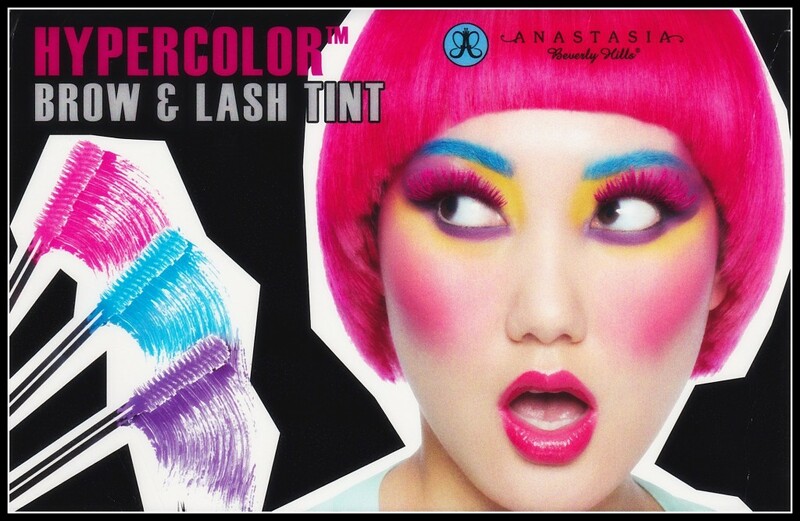 Anastasia Beverly Hills has also just released a cool new way to put a twist on your eyes with hypercolor mascara and brow tint. These tints are extremely pigmented and can be used to brighten up your lashes and brows (if you’re into that sort of thing). This will surely help you stand out in a crowd. These hypercolors also come in pressed powders for your hair! Until next time, have a fabulous week lovelies! Continuing with the Spring 2013 trends theme, lets move on to hair and nails. Starting with hair, a few trends going on this season are natural waves (for that ‘just got out of bed’ look), low ponytails, and braids. 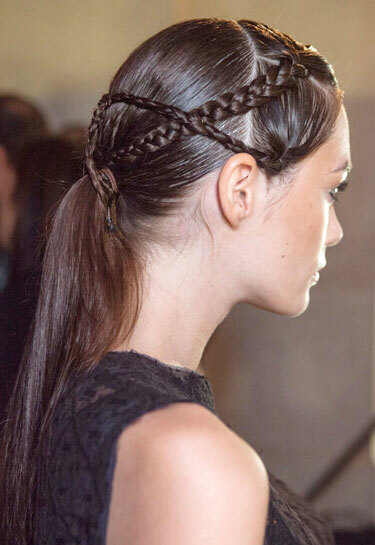 All of these styles take little to no time at all and look beautiful when correctly executed. 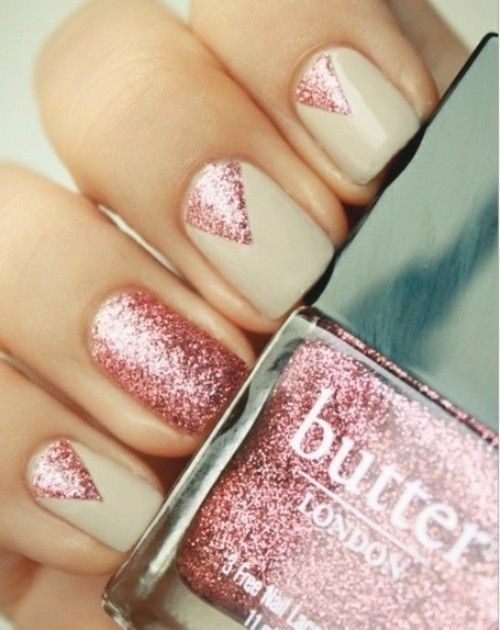 Moving onto nails, some popular fashions are pale nails, dark nails, metallic nails, and two-toned colored nails. These are great to try at home because they don’t take very much effort and you can easily stay on trend. If you have tried, or plan to try, any of these spring trends share them! Spring is in the air, and so is a lot of color. This season if you’d like to make an effortless transition from those dreary winter months into spring, you can spice up your life with some brights. It’s all about the fluorescent neon’s this season. So, if looking like a highlighter is something you fancy, you’ll be on cloud 9. Dressing up a simple outfit with a pop of color is a great way to easily make that seasonal transition. A bright colored piece can help you move into spring. This does not limit it to just wardrobe, accessories count, too. On a more neutral scale, mixes of black and white are also coming into play. Strong lines and contrasts of the two hues are beautifully put together to give a sophisticated, yet bold look that is appropriate all year-round. Another huge trend this season are peek-a-boo cutout pieces. It seems as though any store you walk into these days has some form of sheer fabric, or a cutout incorporated into at least one of their pieces. This trend is great because there are easily ways to accommodate every body type, so everyone can join in on the fun. 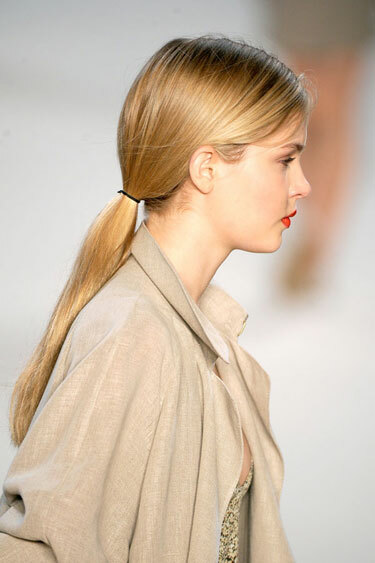 There is a wide range of how dramatic you’d like to go with this look. From a small cutout, to dramatic splits, everyone has an option to further express their individuality. Stay tuned for more spring trends and, most importantly, stay fabulous! Have you ever wondered how your favorite mascara, foundation, or blush is made? Well there is a chemistry behind what makes it last, feather proof, water proof, and more! Chemist are the key components in putting together all the right ingredients that make our favorite cosmetic products. 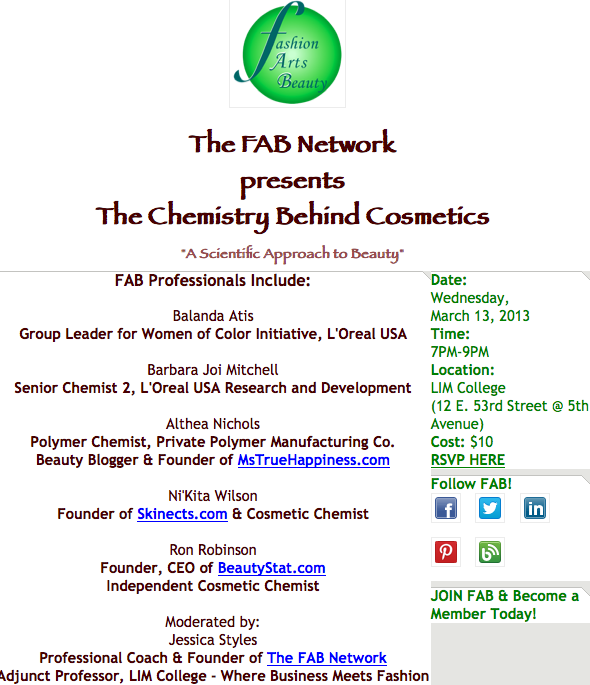 Jessica of The Fab Network will be hosting another wonderful event where you can meet chemist from various industries and ask questions about how its all made! How cool will this event be, at least I think this is so awesome! So I have been away for a few months now. Not good smh… I will try and do better, promise! Here is an article on Essence.com about me, how I became a makeup artist, and tips for anyone who is thinking of breaking into the business of artistry.